CONTROVERSIAL Miracle Prophet Nkosingiphile Dlamini of Bread of Life Ministries is now claiming to have taken people to heaven, where they claim to have seen God. This is according to the brethren of two ministries he visited during an all night prayer at White River, Mpumalanga Province over the weekend. 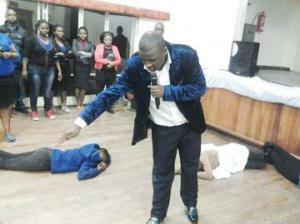 “Some people were taken to Heaven while some started prophesying. One lady was taken to Heaven and she started prophesing that there is a girl who has bad dreams, she sleeps with different men every night, she called the girl to come and receive her deliverance. The young girl came and my father delivered her such that even now she is free thanks to father Babe Prophet,” said a member Sanele Nxumalo.